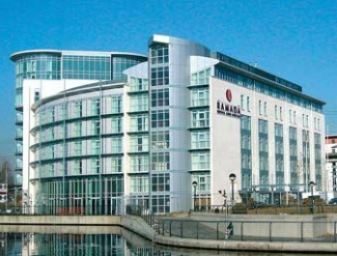 Ramada London Docklands is a 4 star hotel situated in London’s Royal Docks, the hotel has great transport links to within London and key transport hubs around London. The hotel has lots of great attractions within a short journey of the hotel, there is the Canary Wharf’s bustling business centre including a large shopping centre beneath it, the o2 Arena and London Excel Exhibition Centre as well as the Emirates Cable Car. Ramada London Docklands includes 224 bedrooms and is also packed with facilities, restaurant, business suite, en-suite rooms, high speed internet, bar and a gym. Travelling around London is easy and quickly accessible from Ramada Docklands using the DLR and connecting to other various Tube Stations (London Underground). Where is Ramada London Docklands in London?